We’d love your help. Let us know what’s wrong with this preview of Bread and Wine by Shauna Niequist. To ask other readers questions about Bread and Wine, please sign up. I am going to place a hold on it at the library. Sounds like a book my Mom might like. Wonder if it is in large print. 4 stars! I’ve written it before and I’ll write it again – Shauna Niequist is a woman I wish I could be friends with! How does she do it? How does Shauna write such relevant things about life, marriage and motherhood that she seems to have literally taken right out of my personal experiences? She writes from the heart, speaking such simple yet deep words of wisdom and encouragement. I feel that being a mother of young children makes me the ideal reader for Shauna’s books – we are going through th 4 stars! I’ve written it before and I’ll write it again – Shauna Niequist is a woman I wish I could be friends with! How does she do it? How does Shauna write such relevant things about life, marriage and motherhood that she seems to have literally taken right out of my personal experiences? She writes from the heart, speaking such simple yet deep words of wisdom and encouragement. I feel that being a mother of young children makes me the ideal reader for Shauna’s books – we are going through the same phases of life and it is so nice to read about similar hopes, struggles, dreams and experiences. I absolutely adored Shauna’s previous two novels, Cold Tangerines and Bittersweet – they are both on my Favourites list. I actually feel slightly guilty giving this book anything less than 5 stars as I just love Shauna and everything she represents. While a lot of Shauna’s writing involves food and memories revolving around sharing meals with family and friends, I found this book was a lot heavier on the cooking/recipe aspect than her previous two. On one hand, I love that Shauna opened herself up even further by sharing her most treasured recipes, however, I’m not an adventurous cook nor do I personally enjoy reading about cooking and/or recipe instructions (I LOVE eating though, so this is something Shauna and I definitely have in common!) so this slightly took away from the experience for me. I think the focus on cooking and recipes will be a great benefit and enjoyment for a lot of readers though. Overall, I really enjoyed this book and cannot wait to start Shauna’s next book! I’ll end with one of my favourite quotes from this novel. A defense of messy hospitality--of honest friendship, transparent love, and lots and lots of delicious food. At the back of this book, author Shauna Niequist lists some of her favorite writers, including bestselling author Anne Lamott and author, former New York Times restaurant critic, former Gourmet editor, and reality TV show judge (!!!) Ruth Reichl. I'm not surprised. Their influence is clear. If Ruth Reichl and Anne Lamott had a less-talented baby, and that baby wrote a book, this could be t A defense of messy hospitality--of honest friendship, transparent love, and lots and lots of delicious food. At the back of this book, author Shauna Niequist lists some of her favorite writers, including bestselling author Anne Lamott and author, former New York Times restaurant critic, former Gourmet editor, and reality TV show judge (!!!) Ruth Reichl. I'm not surprised. Their influence is clear. If Ruth Reichl and Anne Lamott had a less-talented baby, and that baby wrote a book, this could be that book. That's not a dig, either--Lamott and Reichl are incredibly skilled writers; to be described as less talented than these ladies is no insult. Niequist does not rise to their level, it's true, but she writes in that tradition, and as she has a pleasant--and occasionally charming--style, the book is, by and large, an enjoyable read. However, if you're anything like me (which apparently is my criteria for determining your relative awesomeness), you may also find yourself hating Niequist. Ok, ok. Not hating exactly--not in the 'a pox upon your house' kind of way. But when she starts talking about her many, many trips overseas (did you know they have amazing food in Spain? or France/Italy/Germany/the UK/Israel/Kenya/Australia/etc.?) and the merits of exposing kids to international travel at an early age; her Le Creuset collection; the week-long 'culinary boot camp' she attended in Chicago; or that time she ran a marathon, well ... the Green Eyed Monster in me can't help resenting her. It turns out that Niequist is the daughter of one Bill Hybels, the founder of Willow Creek Church. So of course she's been everywhere. And she's an author married to a musician, which means that she doesn't have to deal with the costs (or, to be fair, the benefits) of a 9-to-5 job outside the home. So of course she can take a week-long cooking course. Not that it's all tea and cookies--while she works out of the home a lot of the time, she also has to deal with the crazy time demands of looming deadlines, as well as the exhausting book-promotion travel that comes with being a successful published author. So, I mean, I get it. Her life isn't perfect. But it does include some blessings that the average wife and mother may not enjoy. Which is probably (at least in part) why she got a book deal--'average harried housewife' doesn't make for an enthralling book jacket blurb. All of which is not to say that Niequist is a bad person, or even a bad writer. I just think her writing might resonate more if she played up the 'everywoman' aspects and kept the 'awesome life experiences that you, the reader, will likely never enjoy, bwa ha ha ha ha' to a minimum. (Ok, ok. She didn't gloat about it. I told you: envy.) She's a good writer, especially when relating her weaker moments, so it's a shame to see her alienating her readers (well, this reader, anyway), even if only occasionally. As for the substance of the book ... there's not a lot, honestly. What substance there is, I quite like. As someone who struggles quite a bit with the sins of perfectionism and fear of man (compounded by a tendency toward introversion), I can easily talk myself out of opening my home to others, arguing that it's too messy, I'm waiting until I have time to honor my guests with the appropriate amount of preparation, I need to bless them with really amazing food, etc. Niequist reminds me that welcoming people into my life--in all its mess--is itself an act of love that blesses others. I don't have to wait until I can entertain perfectly--until I have the perfect house, the perfect kitchen, the perfect menu. I can (and should) throw open my doors and break bread (and drink wine) with friends now. Even if the bread is a frozen pizza, and the wine comes out of a box (because let's face it, I know nothing about wine). One other 'complaint'--well, more of an observation, really. Niequist self-identifies as a Christian. She and her husband have served in ministry roles at several churches (including Rob Bell's Mars Hill and Bill Hybels' Willow Creek), and she talks openly about meeting up with former small group members. The title itself is a reference to Communion--the sharing of bread and wine in remembrance of Christ's death on the cross in our place, to pay the debt for our sins so that we might enjoy eternal life with God. Unfortunately, this symbolism is mentioned only briefly in the opening pages and the closing chapter. The symbolic meaning itself is alluded to, but the Gospel is not clearly presented. And the rest of the book is such that any compassionate theist would likely not disagree. The community Niequist describes is beautiful and appealing, but she and her friends seem bonded by their love for one another; any deeper bond as a result of their kinship in Christ and their shared inheritance in the Gospel as those purchased by the blood ... well, I didn't see it. Not that I expect Niequist to clobber her readers over the head with the Gospel on every page. But I would have liked to see a more uniquely Christian take on community and hospitality. A minor nitpick: Niequist clearly favors stories with happy endings--there are tales of heartache here, of miscarriages, illness, frustrated desires, etc., but they end with recovery, health, long-awaited children, and satisfaction. Undoubtedly, these stories sell better, and are much easier to tell. But God isn't just the God who gets us through the Valley of the Shadow of Death to the joy on the other side; sometimes, we have to camp in the Valley for what seems like forever. Sometimes, we don't see the other side until we're, well, on the Other Side. Those kinds of stories are harder to tell--stories of barrenness that do not end with a giggling baby, stories of illness leading to death, stories of deep desires continually frustrated. But God is in these stories, too. He remains sovereign. He remains good. So I wish Niequist had included a few 'unhappy endings' among her many stories of joy and victory. A Christian's response to thwarted desires and hope denied is one of the strongest testimonies to the Gospel--it sets us apart from a world that sees religion as a means to an end. For Christians, Christ and His glory--and not our desires--are the end, and we continue to praise Him even when He denies us our deepest desire. Because our greatest need has already been met. He has satisfied us with Himself, and has given us a greater Gift than we could ever ask or imagine. It is this knowledge that enables us to remain faithful in the face of hard times. Bottom line: This is an enjoyable book that encourages readers to be more hospitable and to bless their friends and neighbors with food, even if they (the readers) are not Martha Stewart. It's not a terribly theologically dense book, but not every book needs to be a theological treatise. Niequist doesn't set out to write The Theology of Food and Hospitality--she simply encourages us to be transparent in our hospitality and to enjoy the community of shared meals and shared lives. On those terms, this book is a success. Also, practically speaking, she totally inspired me to bring Bacon-Wrapped Dates (p.171) to an Easter lunch (though I used a different recipe, on account of needing something dairy free), and I fully intend to start my own Cooking Club, because that sounds awesome. The books that I love the most make me want to write – they make me swim in words and images, and beg me to jump in. They call me to tell stories, to grab a notebook and try to make a little sense of the messy world around me with my fingers and a pen. Shauna Niequist's new book, Bread & Wine, made me want to write and cook. Write and make grocery lists. Write and mince garlic, splash olive oil, and bake bread. And of course, it made me a little hungry too. Like a good meal, I had no desire to The books that I love the most make me want to write – they make me swim in words and images, and beg me to jump in. They call me to tell stories, to grab a notebook and try to make a little sense of the messy world around me with my fingers and a pen. Like a good meal, I had no desire to race through this book. I enjoyed reading it in morsels, digesting the stories, tearing up at the essays that resonated deeply with me. Maybe because we're in the same place in life – mothers of little boys – I felt a kinship not just with the author, but with the community of women who gather around her table, with the cooking club she meets with each month. And I loved ending the chapters with a recipe – playing it through in my mind, thinking of when and why I might try it out. I'm not trained in any way but trial and error, but I love the kitchen. I love to experiment, to feed others. My grandma has shown me, my entire life, how you fill people up when you get them together and say, "Come on, let's eat." Shauna's book made me want to keep cooking – to make dinner a priority even when the baby is stuck to my legs and my preschooler and first grader are begging for snacks. It made me want to send out more invitations – to invite friends over to eat, to maybe even start my own cooking club – a group of women willing to experiment in the kitchen together. This book made me want to keep telling stories, and to invite more people in, to see entertaining and dining not as something you do to impress or get it right, but to make people feel welcome, loved, and filled in the belly and the heart. I read the introduction to Bread & Wine at the pool one day last week. I cried right there poolside, in the heat, sweating a bit, wanting to cool off in the water, but compelled to read a few more words. I knew immediately that I was going to love this book and I wasn't wrong. There's much to love: Niequist's writing style is casual yet compelling. I nodded along as I read about hunger and shame and how they intertwine in her heart. I wanted to nod along as she jumped in to run a marathon, de I read the introduction to Bread & Wine at the pool one day last week. I cried right there poolside, in the heat, sweating a bit, wanting to cool off in the water, but compelled to read a few more words. I knew immediately that I was going to love this book and I wasn't wrong. There's much to love: Niequist's writing style is casual yet compelling. I nodded along as I read about hunger and shame and how they intertwine in her heart. I wanted to nod along as she jumped in to run a marathon, despite life circumstances that would have justified waiting a year. My mouth watered as I read about blueberry crisp, watermelon feta salad and breakfast cookies (which I plan to make this week). It doesn't hurt anything that, like the author, I love opening my home and table to others. I'm more of a casual entertainer - come as you are, bring what you have, your presence is what matters. But all too often, I let life interfere with my desires to host small gatherings. This book reminded me what a gift food is - in the way it reminds us of our humanity, in the way it unites us all, in the way it points us back to our Creator's provision of Bread and Wine. I am an unabashed fan of Shauna Niequist. I fell in love with her writing the first time I read Cold Tangerines. I’ve since read that book multiple times and have lent it to several friends. Bread and Wine, though somewhat of a departure, as it did focus primarily on food, is written in a similar vein. The chapters are vignette style and each are followed with a recipe that featured somehow in the vignette. I tried to savor it slowly, but I ended up gobbling them quickly. Some were sweet, some w I am an unabashed fan of Shauna Niequist. I fell in love with her writing the first time I read Cold Tangerines. I’ve since read that book multiple times and have lent it to several friends. Bread and Wine, though somewhat of a departure, as it did focus primarily on food, is written in a similar vein. The chapters are vignette style and each are followed with a recipe that featured somehow in the vignette. I tried to savor it slowly, but I ended up gobbling them quickly. Some were sweet, some were savory and some required a pause between bites. I don’t know Shauna, but through her words I feel like I do. She shares her heartaches and joys and presents them all with a vulnerability that was so relatable. I wish she was my sister, my neighbor, my friend. I’ve come to understand that she can have quite the fabulous life, but you know what? She never once name drops or rubs in it your face. She enjoys her life & lives it to the fullest with humility. I am not an advanced cook by any means, but this book has given me courage to try. I love how she tied this in with the kitchen and food and family.Get in the kitchen, get messy, create something fabulous, create something not-so-fab, just try it. And the same goes for life – be present, get messy, be glamorous – just be there. Don’t be a bystander in your own life. I read this on my Kindle (it was on sale & Shauna Niequist – so, duh, I HAD to buy it, haha), but I will definitely own a real copy of this book. I love Shauna's writing style (including in this book) and really loved her first two books. However, this one was my least favorite. I'm still trying to figure out why. Maybe because I don't love to read about food. But I do love to read about messy community and friendship, which the book is basically about. Still, her life is at times unrelatable to me, with her constant talk of travel and dinner parties and spending summers at the beach. I went into this book with some high expectations (Carol Baker loved it) and some low ones (I am not a Zondervan target audience either). I do not read cooking blogs and while I would love to travel it doesn't happen often. All that said, I truly enjoyed reading about Shauna's life and I am looking forward to trying the recipes. There were even a couple passages that mirrored things I had written about in my book which I found fun even though I would have never considered Shauna a kindred spirit I went into this book with some high expectations (Carol Baker loved it) and some low ones (I am not a Zondervan target audience either). I do not read cooking blogs and while I would love to travel it doesn't happen often. All that said, I truly enjoyed reading about Shauna's life and I am looking forward to trying the recipes. There were even a couple passages that mirrored things I had written about in my book which I found fun even though I would have never considered Shauna a kindred spirit, in the usual sense. I found the book transparent enough. It is difficult to be transparent while respecting other people's boundaries. It is a fine line which she handled tactfully. Those of you that watch our monthly book chats know Shauna Niequist is my favorite author. I sing her praises like a canary because she's shaped my worldview and inspired my identity as a writer more than any author. In her third work, she once again delivers a deeply profound, yet completely accessible memoir on building a life that says "welcome, there's a seat at my table for you." I think I want to be Shauna Niequist when I grow up. This was so wonderful. Not-quite-just-a-cookbook and not-quite-just-a-memoir, Bread & Wine celebrates the way the act of eating together provides a common thread through our lives, a setting where the most real moments of love and friendship can be shared, and a tangible, taste-able bond to the memories we hold dear. Shauna reminds me that we are Bread and Wine people, made for communion not just formally on Sundays, but in little ways when I think I want to be Shauna Niequist when I grow up. This was so wonderful. Not-quite-just-a-cookbook and not-quite-just-a-memoir, Bread & Wine celebrates the way the act of eating together provides a common thread through our lives, a setting where the most real moments of love and friendship can be shared, and a tangible, taste-able bond to the memories we hold dear. Shauna reminds me that we are Bread and Wine people, made for communion not just formally on Sundays, but in little ways whenever two or three are gathered. This was such a perfect winter book, full of warmth and comfort, like a rich meal for the mind and heart. Beautiful! I've been in the habit of making meals out duty and I haven't enjoyed the process. I LOVED how she thinks about meal making, how it's a way to show love & connect. But this book isn't just about cooking, it's about relationships & God & so much more. I really, really enjoyed it! Well, I think I am becoming a Shauna Niequist super fan. She writes so warmly, so clearly, so honestly and often she has feelings just like me. I'm now listening to her podcasts, which are excellent, by the way, and have her book Bittersweet: Thoughts on Change, Grace, and Learning the Hard Way waiting for me at the library. This book would be a lovely gift to give to a friend. It's been awhile since I've been immediately captured by a memoir -- I laughed and cried, the latter more often than the former. I very much appreciated the honesty with which she wrote about her own struggles and some of the struggles of the people in her life. Messy truth, FTW! I also read this book with a great deal of envy -- both for her table and the people sitting around it. I love that she's combined memoir with food writing. She's not the first, of course. Molly Wizenberg's A Homemade Li It's been awhile since I've been immediately captured by a memoir -- I laughed and cried, the latter more often than the former. I very much appreciated the honesty with which she wrote about her own struggles and some of the struggles of the people in her life. Messy truth, FTW! I love that she's combined memoir with food writing. She's not the first, of course. Molly Wizenberg's A Homemade Life: Stories and Recipes from My Kitchen Table does this delightfully well, as does Jennifer McGruther in The Nourished Kitchen: Farm-to-Table Recipes for the Traditional Foods Lifestyle Featuring Bone Broths, Fermented Vegetables, Grass-Fed Meats, Wholesome Fats, Raw Dairy, and Kombuchas and even Julie Powell's Julie and Julia: 365 Days, 524 Recipes, 1 Tiny Apartment Kitchen: How One Girl Risked Her Marriage, Her Job, and Her Sanity to Master the Art of Living, which I suppose paved the way for these foodie memoirs. I borrowed this book from a friend, but, as the author suggests, I'm planning to reread this, cooking along the way. And while I'm rereading, I'll be marking a few of the passages that make me laugh and cry and think. p. 57 -- She told me ... this was the point in friendship when sometimes two friends walk away from each other for a while, because the pain and the awkwardness and the tenderness was too great. She said she thought we could do better than that. And then she handed me two pairs of safety goggles. p. 84 -- Approximately one million and one people had suggested to me that when I stopped thinking about it and worrying about it, it would happen... It's like telling someone who's drowning to relax and let the water do its work. p. 136 -- But if the last few years have taught me anything at all, it's that the very things you think you need most desperately are the things that can transform you the most profoundly when you do finally decide to release them. p. 229 -- Probably my friends are not actually counting the days till summer to see if I've finally turned into a supermodel. p. 231 -- I'm not going to hide. I'm not going to bow out of things I love to do because I'm afraid people won't love me when they see my underbutt. Ha! Underbutt. Why have I never heard that term before?! I love it. Not quite a cookbook, not just a memoir but a unique glimpse into the life of an enthusiastic and hospitable woman, I found the book Bread and Wine to be an enjoyable read. Personally, I thought Shauna's writing style delightful. Of course, I may be a little biased on account of the fact that the author has that unique weakness as I for such elite foods as bacon-wrapped dates, figs, chocolate, cheese and such. 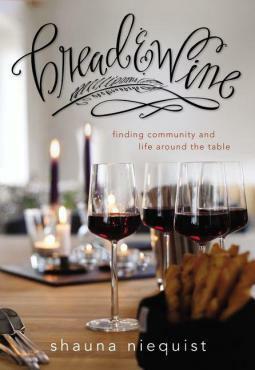 However, regardless of personal tastes, my impression was that Shauna possesses that Not quite a cookbook, not just a memoir but a unique glimpse into the life of an enthusiastic and hospitable woman, I found the book Bread and Wine to be an enjoyable read. Personally, I thought Shauna's writing style delightful. Of course, I may be a little biased on account of the fact that the author has that unique weakness as I for such elite foods as bacon-wrapped dates, figs, chocolate, cheese and such. However, regardless of personal tastes, my impression was that Shauna possesses that unique talent which, through humorous writing, makes even her oddities appear as charming as they must seem to those who know and love her. Simultaneously, the reader is drawn into the ups and downs of the life of this friendly, warm-hearted person. I must add that I question the religious beliefs of the author, and therefore suggest this book not as reading matter to enhance your spiritual life, but rather like many of our favourite heart-warming cookbooks and magazines to give joyful ideas for your hospitality endeavours and friendships. Lastly, in this book the author does not concern herself with health aspects. (apart from the fact that she has a good view of cheese, wine and such) Nevertheless, the several recipes included seemed passing nourishing. :) I can't wait to try bacon-wrapped dates or her Indian-inspired dishes. With wonderful recipes included, from Bacon-Wrapped Dates to Mango Chicken Curry to Blueberry Crisp, readers will be able to recreate the comforting and satisfying meals that come to life in Bread and Wine. I've thought a lot recently about "being present" for the real-time experiences of my life. I don't want to be caught updating my Facebook status and miss the real moments because I'm too busy crafting clever ways to advertise them. All that being said, I think there is tangible value in writing about our experiences. We enjoy our memories more fully as we marinate in their nuances and seek for words to describe them. (Maybe this explains part of why I enjoy writing book reviews?) For author Sha I've thought a lot recently about "being present" for the real-time experiences of my life. I don't want to be caught updating my Facebook status and miss the real moments because I'm too busy crafting clever ways to advertise them. All that being said, I think there is tangible value in writing about our experiences. We enjoy our memories more fully as we marinate in their nuances and seek for words to describe them. (Maybe this explains part of why I enjoy writing book reviews?) For author Shauna Niequist, it's clear that she is capitalizing on this phenomenon in her food memoir Bread & Wine. Niequist takes her readers on a journey through some of her deepest, darkest, richest & warmest memories. All of them circle around making sense of life through the physically and spiritually nourishing acts of sharing good food and fellowship with dear friends. This book has come at a perfect time in my own journey of seeking to tackle unhealthy food indulgences. I've discovered that my poor food habits always seem to center around eating alone as an escape. But Niequist's richly woven picture of a healthy role of food in our lives places it in the context of relationship with other people. I love that! Bread & Wine is more than just a read-once memoir. Every story Niequist tells highlights a memorable meal she shared with family and friends. And so, she also shares her recipes at the end of each chapter. Not advertised anywhere on the book-jacket, but possibly helpful to some, virtually all of the recipes here are unselfconsciously gluten-free. Also, a 20-page appendix crammed with useful kitchen-wisdom is like a warm hug and a parting smile from Niequist as she sends us off to our own kitchens to "go and do likewise." Lyrical writing, recipes that are right up my alley, and an emphasis on loving people by feeding them and being authentic. There is a short but well-curated reading list in the back (cookbooks + good writing on food and life), and many quotes and sections I'll be returning to for hospitality inspiration. This book made me hungry - for good food and for sincere fellowship around the table with people I love. EDITED TO ADD: Four years later, I’m not as enamored of this book, although I still enjoye Lyrical writing, recipes that are right up my alley, and an emphasis on loving people by feeding them and being authentic. There is a short but well-curated reading list in the back (cookbooks + good writing on food and life), and many quotes and sections I'll be returning to for hospitality inspiration. This book made me hungry - for good food and for sincere fellowship around the table with people I love. Bread & Wine is a collection of stories about life around the kitchen table - about family, friendships, and the meals that bring us together. Each story is heartwarming and insightful and introduces the recipes connected to the stories. I love Shauna's writing style. It's normal and relatable yet deep enough to hit you and make you feel what you have wanting to say all along. I found myself saying "Yes! Thank you!" and “I totally get it” in the midst of reading her book because she voices w Bread & Wine is a collection of stories about life around the kitchen table - about family, friendships, and the meals that bring us together. Each story is heartwarming and insightful and introduces the recipes connected to the stories. I love Shauna's writing style. It's normal and relatable yet deep enough to hit you and make you feel what you have wanting to say all along. I found myself saying "Yes! Thank you!" and “I totally get it” in the midst of reading her book because she voices what so many of us are struggling to find the words for. Her recipes are awesome too. Must read and a perfect gift for your girlfriends! Fantastic book! I enjoyed reading every page! The author writes short chapters where she ties food into the personal events writes about (often giving the recipe at the end of the chapter). Beautifully written and very honest. This book makes me want to plan more dinner gatherings and make a better effort to savor meal time with my loves. After reading Bread & Wine I want to cook more, read more, live more, eat good food more, and sit around the table more. Yet, in the midst of all the more, it feels simple more as well—as if the inspiration from Shauna Niequiest is clearing the table of junk mail, lighting a candle, inviting friends, and saying, "Here, let me serve you nourishment and joy." Yes, I pretty much adored this book. This book ranks up high with Molly Wizenberg's memoir for me. And the recipes work. Absolutely fantastic cookbook/memoir mashup, and definitely Niequist's best book to date. It's on me for not realizing a book named "Bread and Wine" would be Jesus-y. I loved this book. And, just to be clear, I've never begun a book review that way! Bread & Wine: A Love Letter to Life Around the Table with Recipes is Shauna Niequist's third book. Unlike many other reviewers, I knew little about Niequist before I began the book. Really, I only knew that she was a blogger, but I'd never even visited her site. But with this book, she won me over. It felt like I was hearing from a kinded spirit and, over and over, I found myself nodding, crying, laughing and I loved this book. And, just to be clear, I've never begun a book review that way! Bread & Wine: A Love Letter to Life Around the Table with Recipes is Shauna Niequist's third book. Unlike many other reviewers, I knew little about Niequist before I began the book. Really, I only knew that she was a blogger, but I'd never even visited her site. But with this book, she won me over. It felt like I was hearing from a kinded spirit and, over and over, I found myself nodding, crying, laughing and drawing little pencil hearts in the margin to mark my favorite points. The book is arranged into four sections, each consisting of about 10 essays. Most of the essays are followed by a recipe referenced therein. I liked the essay format because it was easy to read a little at a time. Food, of course, is the predominate theme throughout the book, but addition topics include Christianity, infertility, miscarriage, family, friends, body image/self-confidence, parenting, hospitality and running. Her life was transparent in these pages. Sometimes that was hilarious, for instance, when she talks about training to run a marathon ("the runners themselves kind of freaked me out"). Other times the honesty was sobering and convicting. The essay 'Hail Mary' made me cry as she talked about being all alone in the hospital with a very sick baby and I thought of my own baby and how terrifying that would be. Niequist is a foodie. She admits to obsessing over dinner parties and getting carried away when planning events. But it didn't come across as snobby. In fact, what I loved about the book was that she urged the reader to 'Start Where You Are' (the title of one essay). She says to "order pizza and serve it with a green salad and a bottle salad dressing." In other words: don't let not being a perfect chef stop you from entertaining. This same idea was seen in another essay 'Open the Door' where talked about hosting in less-than-perfect situations (e.g. a tiny apartment). Over and over again, you see how Niequist sees food as a way to connect with people. And that's what I loved. This book was about food, yes, but it was about more than that. As I said before, I knew very, very little about Niequist before this book. Through reading the book, I picked up on the fact that her parents must be well-known. A quick Google search told me that she is the daughter of Bill and Lynne Hybels (the founders of Willow Creek Church). Near the end of the book, she mentions hosting a dinner for a family friend named Shane. As she described a little more about him I realized was Shane Claiborne. While Niequist could have done a lot of name-dropping throughout the book (it's clear that her family is well-connected), I appreciated that she didn't. She just wrote. She was simply honest and, with that, she won me over. Since I'd never read any of her other writing (blog or books), I do wonder if this could have felt like a repeat to some readers. I have read other books by bloggers and, sometimes, it seems that they simply recycle their blog material and turn it into a book. So much of this book is based on Niequist's life, so there may be repeated stories from other places. I wanted to love this book, but I didn’t. I wanted to like this book more than I did, particularly because a dear friend from church handed it to me one day and asked me to read it. We are the same age and about to see the decade of the sixties approaching this year. While in the middle of the book, we talked briefly about it, and I told her I was struggling to continue in it. We both agreed that it was difficult to relate to . . . maybe because of a generational thing. I erroneously thought tha I wanted to love this book, but I didn’t. I wanted to like this book more than I did, particularly because a dear friend from church handed it to me one day and asked me to read it. We are the same age and about to see the decade of the sixties approaching this year. While in the middle of the book, we talked briefly about it, and I told her I was struggling to continue in it. We both agreed that it was difficult to relate to . . . maybe because of a generational thing. I erroneously thought that this would be a quick read, but it wasn't for my lack of interest. I do not want to denigrate Niequist's person, her life, family, or experiences, and I do not think one can "rate" those personal and private things. I will say that to put much of those personal and private things "out there" in print for the world to read invites both compliments and the difficult-to-swallow criticism. My compliments are the recipes of which I hope to try a few. My criticism falls more in a I-have-difficulty-relating-to category and hopefully be read as such. I understand life around the table. We raised our family at and around the table. But our life was not driven and fed by the need to have other people outside the family at the table for our personal sustenance or for entertainment. Rather, when we did have people around our table, our intention was to show hospitality. Again, I wonder if this is not a generational thing. I tend to wonder if it is more of a personality thing, introversion versus extroversion. In my reality, I could not have Niequist's lifestyle. Parties, parties, parties. (We probably haven't had one "party" for her three over the course of our almost forty-year marriage.) For one, it would have distracted me from the duties of a wife and a mother. For another, we could not have afforded it. As I read her story, I felt that that lifestyle had to have, by necessity, imparted a somewhat division of the family . . . . By that I mean that all those life-around-the-table dinners given, most were for the adults, later in the evening, when children were tucked into bed, having eaten their meal earlier and apart from the family, and left with babysitters. That kind of life was not like mine, either growing up or raising my own children, so understanding the need for that driving force of “party” is beyond my ability. Honestly, I am not able to wrap my mind around the economics of all the food-buying, entertaining, and the traveling. I'm not a tightwad nor a spendthrift, but frugal and prudent. I just see things differently. The title of Bread and Wine immediately brought to my mind that the book would make connections with the Lord’s Supper. Wrong. Though the Lord’s Supper is referenced a few times as “Communion,” there is no biblical connection, and any implication is obscure. I also have some difficulty with the expressed and ignored theology which is embraced, implied, associated and/or “related by association” in this book. That’s a mouthful, and all I’m going to elaborate on with this subject. I'm not the kind of reader who's into "food memoirs" as a genre, and I definitely don't read cookbooks for fun. (I skimmed the recipes in this one.) Nonetheless, I understand why I see this book pop up over and over again. Niequist convinced me that I could learn to cook, if I wanted to; that I could run a marathon, if I tried; and that if I really just need a nap right now, that's OK too. Niequist's honesty and relatability, coupled with her beautiful turns of phrase and her luscious description I'm not the kind of reader who's into "food memoirs" as a genre, and I definitely don't read cookbooks for fun. (I skimmed the recipes in this one.) Nonetheless, I understand why I see this book pop up over and over again. Niequist convinced me that I could learn to cook, if I wanted to; that I could run a marathon, if I tried; and that if I really just need a nap right now, that's OK too. Niequist's honesty and relatability, coupled with her beautiful turns of phrase and her luscious descriptions of food, made this book a joy to read. Even in her writing, she practices what she preaches about throwing open the doors and inviting people into the realness of your life as it is. Her advice about learning to cook and learning to host is practical and hard-won. It almost made me wish we didn't live in a place where we got free meals at a dining hall; it did make me glad we live in a place where we can gather with friends easily and frequently. Perhaps I've read too many blogs-turned-memoirs lately, but the disconnectedness of the essays/posts irked me more than usual in this one. We're constantly hearing about "this summer," "this fall," "last year," and it made it hard for me to keep up, especially when there were huge gaps (that jumped around in time) between the stories of learning she was pregnant, the difficulties of her pregnancy, and her son's birth. Maybe what bothered me most was the optimistic future-looking of times that were already past: This Christmas I'm not going to over-schedule us; this summer I'm not going to worry what I look like in a swimsuit. I was not allowed to forget that these chapters were written at a specific moment in time well before the "present" of the book's completion, and that kept it from being a 5-star read for me. Every day, when I walk to my mail box, I long for something amazing. A letter from a long lost friend… a large check… a book that will transform my life. I’m still hoping those checks and letters will arrive, but I recently received a wonderful ARC to review! Bread & Wine – A Love Letter To Life Around The Table With Recipes by Shauna Niequist contains many mouth-watering recipes – but the book is about much more than food. Bread & Wine celebrates the sacred moments that occur when people Every day, when I walk to my mail box, I long for something amazing. A letter from a long lost friend… a large check… a book that will transform my life. Bread & Wine – A Love Letter To Life Around The Table With Recipes by Shauna Niequist contains many mouth-watering recipes – but the book is about much more than food. Bread & Wine celebrates the sacred moments that occur when people gather in their homes to share meals. • Examine the areas of our lives where we experience true hunger. • Learn how to celebrate and create new ones. • Build and sustain community. Bread & Wine isn't just about nourishing our bodies – it’s about nourishing our souls. It’s about staying connected and fighting our tendencies towards isolation. • How do we invite people into the messy spaces of our homes and lives? • How do we let our walls down, throw open our bolted doors, let people in? Bread & Wine is a great book for personal reflection. It’s also a great book to discuss with your friends! In the Appendix, Shauna includes a four-week book club and cooking club discussion guide to help you to put what you've learned into action. I really loved Shauna’s book. I loved the stories Shauna told. I loved how Shauna invited us into the nooks and crannies of her life. Disclosure: I received a copy of this book from the publisher to review. I was not compensated or required to write a positive review. The opinions expressed in this review are entirely my own. A friend of mine read aloud an excerpt of Bread and Wine as a morning devotional before meal prep for church one morning about 4 years ago, and it was so lovely I added the book to my wish list. When I finally picked it up to start reading, I was nervous since the table of contents read like a cook book and I thought maybe this wasn't what I had in mind! Thankfully, I was pleasantly surprised by the beautiful stories that accompany each recipe. In Bread and Wine, Shauna Niequist tells the reader A friend of mine read aloud an excerpt of Bread and Wine as a morning devotional before meal prep for church one morning about 4 years ago, and it was so lovely I added the book to my wish list. When I finally picked it up to start reading, I was nervous since the table of contents read like a cook book and I thought maybe this wasn't what I had in mind! Thankfully, I was pleasantly surprised by the beautiful stories that accompany each recipe. I had the blessing of receiving an advanced copy of Shauna Niequist's newest book, Bread & Wine, and I loved it. Loved it. Like Cold Tangerines and Bittersweet, I found myself nodding emphatically at some parts, crying at others, and different than her former two books, salivating over the delicious recipes that are sprinkled throughout this wonderful love letter. Shauna describes her life, her heart, her soul and how it is connected to spending time with people, preparing food, eating with th I had the blessing of receiving an advanced copy of Shauna Niequist's newest book, Bread & Wine, and I loved it. Loved it. Shauna describes her life, her heart, her soul and how it is connected to spending time with people, preparing food, eating with them, and sharing the deepest parts of her heart with her family and friends around a table. The way she describes certain moments - well, I felt like I was experiencing them with her, firsthand. She writes with such poignancy and such depth about her life's real moments. And she's not afraid to get really really real. The part about overcommitting and being exhausted? I was empathetically sobbing. The part about licking the icing off a cupcake as she's walking onto a stage to speak? I would totally do that. The part about being in the hospital with her sick newborn and being so scared? I felt that, too. I love this book. You will, too. I've long been a fan of Shauna's writing. (Check out her other books.) And of her philosophy on living life. Mainly because I too have long been a bread-and-wine person. Shauna explains: "More than that, I am a bread-and-wine person. By that I mean that I'm a Christian, a person of the body and blood, a person of food and drink, and also, at the very same time, I recognize them as something much greater--mystery and tradition and symbol. Bread is bread, and wine is wine, but bread-and-wine is ano I've long been a fan of Shauna's writing. (Check out her other books.) And of her philosophy on living life. Mainly because I too have long been a bread-and-wine person. This book will make you want to gather the people you love around your table so you can feed and love them well. Shauna gives you permission (and recipes) to have cookies for breakfast (or quinoa and sausage, or goat cheese scrambled eggs). She'll teach you to make bread, vinaigrette, risotto and more. She'll give you permission to throw a dinner party, even if your house isn't fully clean or your food fully ready when the doorbell rings. She'll make your mouth water and your heart grow. But most of all, she'll give you stories to reflect on as you get into the kitchen and begin creating flavors and memories.